Learn how to make fast behavioral & emotional changes without psychological dependence upon the therapist. Take this digital downloadable course in the comfort of your own home or office, on your own time, and at your own pace. Learn the right way – progressively and by listening, analyzing and reviewing actual sessions with clients. The Subconscious Rapid Transformation Technique (SRTT) course has been taught only once. Only a handful of students were lucky enough to learn this technique and be certified. 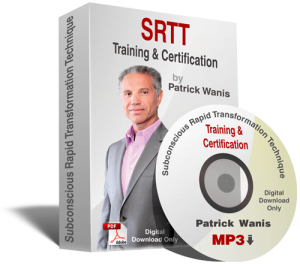 And now, Patrick Wanis is offering you the SRTT package – all of the recordings, transcripts and assignments so that you too can master this technique and get bigger, better faster results for your clients and charge more per session and generate more clients and more business! Learn the same way the first group of students of SRTT did with Patrick Wanis. Listen to actual live recorded sessions by Patrick Wanis with clients as well as analysis of these sessions. This is a unique course that does not focus on theory but rather teaches you by letting you listen to real sessions, and then carefully explains the process, method and reasoning. FREE BONUS 4. Audio recording and transcript of an interview by Clifton E. Brantley LMFT of Patrick Wanis, “Crying & Reliving Pain & Trauma Doesn’t Heal You.” Patrick Wanis explains why reliving painful emotions in therapy does not heal you, and he reveals how SRTT safely and effectively releases emotion, and gets to the root cause of the issue. – It has brought me more clients! – Thanks again! You’re a very talented, deeply intuitive Coach; you are helping so many people, in more ways than you even know! – I am thankful for your method on student questions and input, it is showing an extreme appreciation for your time, and individual levels of understanding and learning! – My practice and focus on life coaching in Costa Rica has made positive strides because of SRTT…It has been my goal and dream to help people actually have a new perspective, look at life with a new eye, and gain a real transformation…I have been able to use all of the steps at one time or another incorporating them into session easing my clients into a real change. – There are so many things I have actually gotten from this program, all of them unique and distinct from my clinical coursework as a marriage and family therapist and I believe that they will be useful as supplements to the foundation that I’ve already laid. – SRRT was so successful in giving this lady [my client] hope and power to move forward in her life with a clearer understanding. I feel she found transformation from releasing the emotion from [her past traumatic experience]. – Not until I learned SRTT was I able to learn the importance of core or root beliefs and how much impact it has on everyone’s daily lives. I have incorporated the SRTT element into my RRT process as well as using the SRTT process completely. Both ways what I have learned in the course has been awesome training for me and enhanced the healing I can give to my clients. I am able to effect healing like I never did before. – The greatest success is that she [my client] wants extra sessions than I had planned! So she is pro-active in her healing. – Once again, I want to thank you Patrick for the wonderful job you have done in conveying the art and craft that you have cultivated over so many years. It takes greatness and humility to be able to share and not hoard our successes. – This training has given me more than just knowledge of the technique itself, but through the sessions, I became more confident in my practice, more productive, and had renewed insight towards discovering the roots of issues. It is powerful to master knowing how to develop a client from the ‘roots’ of the issue, into a journey of discovery to healing for them. This has been so enlightening that words just can’t describe the difference it is making in the lives of other’s! THANK YOU SOOO MUCH!!! – I feel very lucky to be part of this experience. Thank you. SRTT has taught me amazing steps to actually have a true deeper shift in the subconscious. It has also brought me more clients and clients that really want to be helped not just heard. At the beginning of the course I remember complaining that no one really wants to shift their core beliefs and deal with the real issues and let go of the emotion. With just two positive experiences I had someone calling me who really did want help. The way SRTT has reestablished me in this community as not just someone to listen but someone who can really help is by far the best thing that I have taken from all of this. It also reestablished that I am good at what I love to do, and I can help people live happier healthier lives. You have given me the right tools, the process step by step, the transcripts to go back and continue to learn and I am so grateful for all of it! I have found the SRTT to make a profound difference in my coaching and healing practice. With the SRTT, I can talk directly to core issues within minutes without making the client feel they are exposing themselves. With new clients I am able to give them a sample of SRTT and they can see immediately the profound benefit of working the technique as very quickly they can release old trauma and find a simple way to connect to themselves. I am a somatic therapist who works with the body and movement and now I can use the SRTT technique over the phone to help clients shift their emotional perspective and beliefs on their body. This part of the technique is simple and powerful and works. Perhaps the most important part of the technique is that it doesn’t use mumbo-jumbo but talks straight to the heart and feelings of the client and gives the client tools to release and shift their emotional blockages, experience forgiveness and compassion for themselves and claim emotional power, self confidence and self value. From the first class I was using elements of the technique with my clients and saw their enthusiasm to know, do and experience more. The technique is also simple to integrate with other modalities such as coaching, counseling and therapy. With SRTT, I personally have gained a deeper respect for the how the client has the answers to their happiness within themselves. The SRTT is a non-judgmental supportive tool that talks to the inner child and empowers the adult to resolve their past and find their inner gifts to create their future. The audio files of live actual sessions with Patrick’s clients provide a valuable resource to return to as you review how clients with Patrick invaluable years of mastery with the subconscious, find their way to shifting negative beliefs. Congratulations Patrick on creating such an uplifting and inspiring tool for both client and practitioner! I was very lucky to have been chosen to be involved in the first SRTT Training Course. The training was such an awesome experience, both personally and professionally. Dr. Patrick Wanis is an excellent practitioner, trainer and is very astute about the needs of his students. The course exceeded my expectations and delivered more than I had experienced in other training settings. SRTT gave me new professional skills. SRTT key elements, process and principles taught me to conceptualize helping my clients a whole new way. Utilizing the key elements of SRTT with my current skills have helped me to achieve deep changes and quicker. Each element I learned in SRTT Training Course I have used in my practice and my clients have validated their effectiveness. All the skills that I gained from SRTT training has given me a larger and stronger battery of coaching tools that I incorporated into my coaching practice and use for the benefit of my clients. Even though the SRTT coursework and homework is hard and takes many hours to effectively learn the SRTT Process, the benefit was more than I ever imagined. Thanks again for allowing me to be a part of your first SRTT Training. I just want to take the opportunity to thank you so much for a very valuable and stimulating workshop. I really enjoyed all the information and particularly your wonderful teaching style. I really hope one day to have the opportunity to meet in person. Thank you for the truly wonderful way that you have of relating to your students as well as your clients. Your way of speaking is so clear and accessible and you make a wonderful point of really addressing everyone’s questions. I feel very lucky to be part of this experience. Thank you. I also was able to learn a lot from your reviewing the previous sessions in depth, answering our questions in detail, and making further comments about the previous session. The reason this helped me to retain the process information, is because the majority of my retention was from the review, and re-listening taking place ‘after’ the original session. SO your taking detailed time in a new session to review and discuss aided in learning the process more effectively. I appreciated your method of live questions during the sessions online, as this allowed for more understanding, yet did not allow the class to get off track. In my coaching practice, I am amazed in the number of people who harbor ill will toward the individuals in their life who do not follow through with what they say they will do. I strongly encourage people to allow “Their word to be their bond”…commitments are not taken lightly, when followed up on and followed through; they create a high integrity factor, a dependable reputation. When commitments fail to be carried out, it diminishes one’s credibility, weakens their character, and they are less likely to be trusted, or even taken serious. I was joyfully astounded when Patrick not only fulfilled his promises and commitments to what we could expect from the SRTT training, but he continuously restated the motives and criteria to be covered for the training, and then exceeded his own agenda by not just reviewing the material promised, but delivering more time, more attention, and personal correspondence throughout the program! Thank you again, Patrick, for the time and attention you gave our first, graduating class of SRTT!!! Christian Life Coach Founder & President, Inspired Life Coaching, Inc.
For the first time, the creator of The Subconscious Rapid Transformation Technique (SRTT), Patrick Wanis PhD, coach to the coaches, is sharing and teaching his therapeutic technique. Patrick Wanis hand selected a small group of students to learn and be certified in SRTT. And now, he is offering you the chance to learn his techniques and to have access to entire training program that Patrick used with his select students. This Subconscious Rapid Transformation Technique (SRTT) course is not taught anywhere else nor is it available in any book, video or anywhere else. This is not hypnosis, NLP, Gestalt, CBT, Jungian Therapy, RoHun, Somatic, Transpersonal or Rational Emotive Therapy“, although certain elements of these disciplines and therapies are incorporated into SRTT. The above price does not include the process for certification in SRTT. This package is not for everyone. But it is for you if you are serious about learning a unique therapeutic tool, one of the most powerful therapeutic techniques that guarantees you get bigger, better faster results for your clients and for which you can charge more per session and generate more clients and more business! To own and take the Subconscious Rapid Transformation Technique (SRTT) training course, you MUST fit the criteria below. If you still want more information and extra insights about the SRTT Training course and package, click here.